Join author, speaker, and Executive Producer Matthew Leonard in this beautiful, awe-inspiring series in which the Mary of doctrine and devotion comes alive in a powerful, new way. All in all, you will experience Mary as you’ve never experienced her before! 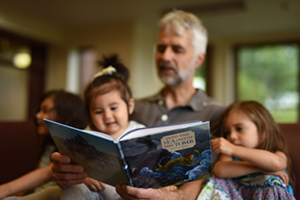 The Bible and the Virgin Mary is part of the St. Paul Center for Biblical Theology’s dynamic Journey Through Scripture Bible study series. It is based upon Dr. Scott Hahn’s bestselling book, Hail, Holy Queen. I watched the whole series during lent and Easter. I loved the whole course so much that I ended up sharing the video streaming to my friends and family through social media sites. We had some discussions too which made us really love our Lady deeply. I am grateful for this valuable opportunity of studying the classes online. I found this bible study to be a wonderful addition to my studies and very informative. I watched the Bible and the Virgin Mary in 2017 and The Bible and the Sacraments in 2018. I also got my husband to sit down this year and he watched both series. He also found them very enlightening. I look forward to doing more in the future and have provided the website to others at our parish council meeting. Hopefully, we can work to bring this and other types of studies to other members of the parish to increase their knowledge of the Catholic Faith. Thank you St. Paul Center & God Bless you all! Yes, we’ve now set this up to work. There’s a button to add the DVDs with Spanish workbooks and leader guides here. I watched the series with the exception of the last two. I am so grateful that these videos were made available. So much to learn. I hope to review and listen this series again. So much to know about Our Lady. I am the grateful one to have the opportunity to learn this. God Bless those you make this available to all of u. Just like The Bible and the Sacraments, this series on the Bible and the Virgin Mary was fantastic. Clear, easy to access and easy to follow. Both educational and inspirational, I could not wait for the next sessions to be released. The narrator was wonderful. Thank you for this great service to our faith! The Bible and the Virgin Mary is easily the most interesting and most informative source of information on Mary I’ve ever watched, listened to, or read. The information was new to me, and the presentation was clear and inspirational. I can’t imagine anyone not being inspired to love our Holy Mother and recognize her importance in salvation history after watching this series. watched the series did not complete looking at the bible and the virgin Mary. however the teaching were revealing and has deepen my understanding of who Mary is and the connection in the old testament. great! Hail Mary , Full of Grace ! God bless to all of you who worked so hard to make this possible. It was an amazing experience. All the more I love our Dear Mother Mary. I would like to thank Dr Scott Hahn and Mr. Michael Leonard for such an excellent presentation. How everything relates between the Old and New Testaments opened my eyes. It was very clear. Thank you St Paul Center for working hard to help us understand the Scriptures and deepen our faith! I needed to go deeper with Mary to make sure she is deep in my heart. ..in my roots with Jesus. This course has helped me enormously and more ….. it’s like a spark that sets you on fire. I have a deep desire to share it with others and have bought the series on DVD . I have done it on different occasion and at times I have lend them out. Thank you so so much Lord for the gift you have bestowed on my brother and sister to produce this “food” for my journey. It was excellent in every way but simply didn’t not have the luxury of that much time to spend. I hope to in the future. Keep up the great work and don’t compromise for the sake of people like me. I know that there’s many retired folk that must have received great graces by spending time on that beautiful exposition of our Blessed Lady in Scripture. I hope to be one of them soon! I watched them both last year and this year. They’re both GREAT in terms of content, presentation and format! Matthew Leonard is very ENGAGING. I learned a lot! It’s better when the free streaming is not done in installments because we can do it in a row without having to review the previous episode – there’s continuity of thought. Besides, there are days when we’re busy for a week and run the risk of missing an episode. THANK YOU for the free streaming. I was fortunate to be able to watch the Bible and the Virgin Mary. There is so much to learn about the Bible and about Mary. Michawl Leonard made the series exciting and the need to get to the next lesson to continue. I always thought that I knew Mary. I did not begin to know her. Now, I feel very comfortable and close to the Virgin Mary. The desire to learn more is very strong. Realizing the connewcrions and learning of Mary’s true role in salvation is remarkable. I thank Dr. Hahn and Michael Leonard for this remarkable series I look forward to more of the same. I wanted to deepen my knowledge of and love of Mary. I desired to be able to pray the rosary with greater devotion and understanding of the mysteries. This study greatly helped me reach my goal. However, the study did so much more in strengthening my relationship to Jesus and his Mother. Thank you for this great offering. I look forward to other offerings. I loved this series, and did it last year. I was doing another series this lent so did not repeat it. 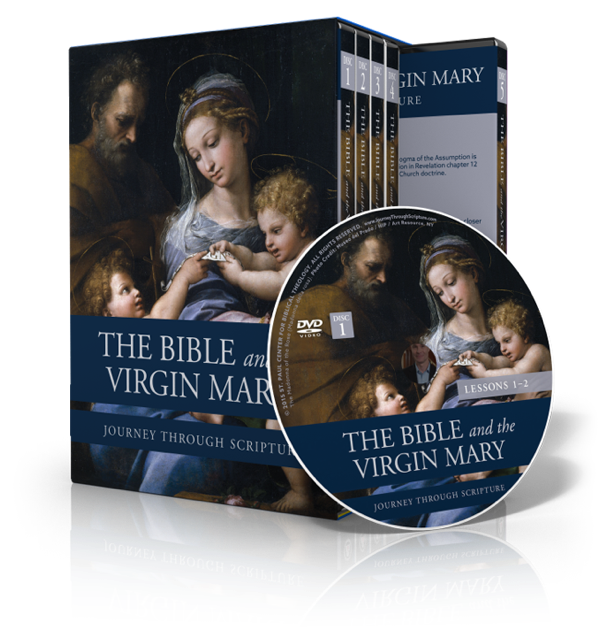 The Bible and the Virgin Mary; it is a most beautiful, enriching and inspiring series. Enjoyed it profoundly. It is very informative, extremely well researched and very well presented. Superlative in any respect; I highly recommend it for personal and for group study, to learn more about our Blessed Mother and her role in Salvation History. 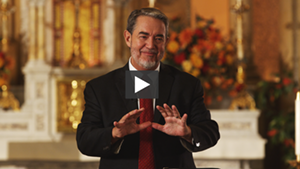 A sincere “Thank you” to Dr. Scott Hahn and to Matthew Leonard. Truly well done! My teen son and I watched both of these series (“The Bible and the Virgin Mary” and “The Bible and the Sacraments”) when they came available the first time. They are both very well done and I highly recommend them to everyone. I very much appreciated that they were available for free and that we could watch them at any point during the school day. Matthew Leonard was a good speaker and did a great job of sharing the information from Scripture, Scott Hahn and Jacob Wood. Although I didn’t learn a lot of new information, it is always great to be reminded of, and reinforced in, our Catholic Faith. Thank you for gifting everyone with these two series. The Bible and the Virgin Mary was of great interest to me, because I needed to be able to respond to many of the terrible slurs against Our Lady, and the series left me with the knowledge I needed. When our first class had finished, one of the ladies told me that when I had put up my poster in the church, advertising the bible study, she was over the moon! She said that the study, at that time, was an answer to prayer. The reason was simple, she was a recent convert and was having a difficult time with the Blessed Virgin. When the Bible and the Sacraments became available, she was one of the first people to register. Absolutely beautiful. So deep, real, and instructive that I listened again and again. God bless you for your work. Highly recomendable. This video presentation was beautifully done in every aspect. The explanations with references to the OT and NT are enlightening. The content is completely orthodox and fully explained. The touching music and pictures enhanced the total presentation Matthew Leonard. Thank you, Mr. Hahn for all your biblical research which made this presentation possible. 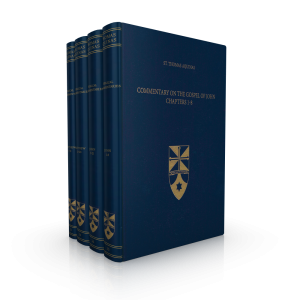 This study is an exceptional resource for understanding the Biblical foundations of Churches beliefs and practices regarding the Virgin Mary. Anyone curious about the Catholic understanding of Mary’s role will definitely benefit from this study. I suspect even people well versed in the Marian practices will also find this useful. Mary is just more close to me as a mother and human being after this study. I realised her greatnes and role after watching this. She is just perfectly simple, one of us, and on the other hand and most holy woman in history. As her husband Joseph, she never puts herself in the center. But she is always there, with her Son, unseen by people, humbly doing God’s will. I thoroughly enjoyed the bible study The Bible and the Virgin Mary. I really figured that it would just be a rehash of all that I know about the Virgin Mary but it was so much more. I learned so much about the Virgin Mary and her role in the life of Christ. I would highly recommend it to anyone who is in need of enriched learning of the bible. I ordered the workbook and enjoyed doing the two together – the video and the workbook. I viewed the Bible and the Virgin Mary on my laptop during Lent 2018. Because my New Year’s Resolution was to get to know Mary better, the Hail, Holy Queen book and the workbook was purchased to be better prepared. Settling onto the sofa one evening, I was blown away! The biblical cross referencing is staggering. I began to look forward to the quieter part of the evening when I could immerse myself in Mary. But a concern did develop. I feel there is so much information, it is a cognitive overload. Much of it is auditory and I know myself as a strong visual learner. During the second lesson, I had the feeling things were going in one ear and out the other. Better to take notes and so, because I was in my own home, the advantage of backing up and replaying the stream for content to be organized, written down and reviewed was available. The scope and range of the Virgin Mary series runs deep, I cannot imagine it being shown as a one hour weekly bible study in a parish. 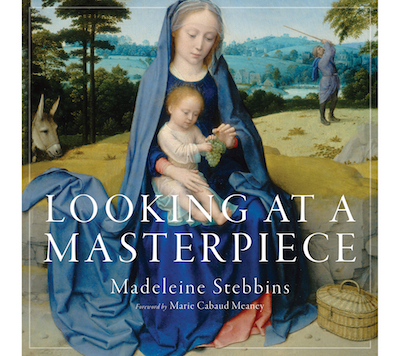 I enjoyed this study of Mary immensely and found it illuminating, yet scholarly, not for the weak willed or faint hearted. The lessons both on the Bible and the Sacraments and the Bible and the Blessed Virgin Mary are quite inspiring and enlightening. It is very uplifting .As Catholics, let us request the Blessed Virgen Mary to put us all under her blue mantle for protection and guidance. I very much enjoyed this informative and visually lush series. I am not a practicing Catholic, but a very active Christian in various other churches. It was wonderful to celebrate Lent with this series and to learn more about what my Catholic friends and family believe. Thank you for making it readily and freely available. I am a Catholic but my attitude towards Marian devotions were more like”..Go directly to Jesus why need to go through Mary” I had always wondered but never searched for answers on why our Blessefd Mother Mary was given a long litany of titles…NOW I know Our Blessed Mother’s role in God’s salvation plan and has lead to a change in my whole attitude towards Marian devotions. I thank God, St Paul Center for this inspiring Scripture videos and excellent presentations. I loved this series! It was the first time that I participated in an online study and it was wonderful. The visuals were meaningful and reflective of the subject offered that day. My love for the Blessed Mother grew with each lesson. The information I learned will help me share with others my love and admiration for her loving fiat for humanity. Thank you all for your blessed work! While I have always been devoted to Mary, and have always recognize the special place she has in her Son’s heart, I never realized the depth of her significance to the salvation of the world, and the life of the Church. This series has not only been extremely enlightening, but it has also been beautifully presented. I am so happy St. Paul Center offered this to us – I am forever grateful. It was a privilege to view this series. Awesome and inspiring just as the Bible and the Sacraments. Love how the scriptures are used and how the Book of Revelation is revealed to us. I now have a whole new understanding of our Queen Mary, our Mother as I never had before. The use of your materials for a group setting is perfect. Having the length of the DVD at 30 minutes or less is just the right. You are able to stop the viewing at any time and discuss before moving on so that the individual class can be customized. Excellent material layouts !! For lent this year I decided I wanted to learn something faith based. So I did the Mary and sacrament with the bible series. Both were wonderful. While watching the Mary videos I felt so full of hope. It was almost overwhelming at times. I am so greatful that these series were recommended to be by my friend. I fell blessed having the privilege to learn from both series. I will not lie. The Mary series was my favorite. It just felt hope filled. I found the program to be excellent & most informative. It helped me to learn more about actual Catholic doctrine as to the virginity & perpetual virginity of the Blessed Virgin. Unfortunately I was unable to catch 1/2 of lesson 10 & the last lessons. I have a particular affection for Our Lady of Guadalupe. I was blessed by my visit to her shrine in Mexico. Now we attend the Spanish Mass in our parish which has been made bilingual ( English & Spanish). We have been very warmly received by the Spanish community. We also work with the ST. Vincent de Paul helping to welcome new immigrants & refugees coming from Mexico and Central & South America.by providing much need household goods. Thank you so very much for the opportunity to learn in the comfort of our own home! Blessings!! I enjoyed the opening information on the Marian shrines. I most enjoyed the references to Mary in the Bible and the emphasis on her part in Salvation history as well as her model of saying “Yes” to God – without question or hesitation. Great reminder, clearly presented in plain English. The visuals and music were beautiful . The content was good. However, it takes about an hour to watch each one, and we weren’t learning new material. We have a thorough background in the faith. So, unfortunately we haven’t been watching these series. In general I would highly recommend them. This was an amazing study. It helped me with areas of Marian teachings that we didn’t cover in RCIA. Absolutely loved it! It was enlightening & enjoyable. I was so impressed by the study that I purchased it and presented it to three local parishes in my town. 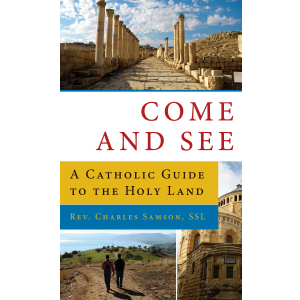 It was extremely well received and I plan to do it again with the Bible and the Sacraments. The presentations are extremely profound and in-depth but easy to understand and comprehend. Thank you for all that you do and God bless. The Bible and the Virgin Mary was one of the best programs I have seen….I purchased the Program for our Young Adults group for them to utilize for THEIR Bible Study group and to “pass it around” and share … I had hoped THEY would take it to another level and do multiple presentations for the parishioners / but their organization skills are a bit lacking at this time…. I will work with them again and just offer Parish Bible Study on “Mary in the Bible” beginning in May for six weeks. PS – thank you Matthew Leonard for your team’s terrific work and presentation. God Bless all of you and your families. Absolutely LOVE it! Brought insight to my understanding of Mary, our Mother and deepened my love for our heavenly Mother. Some of the apparitions that were covered were very new to me. I had never heard of them. Thank You for given me this really amazing information during lent! May God Bless you all!!! Very informative. Understand more the relationship about Virgin Mary, the Bible, the church and each individuals. Learn more in-depth of the church teaching, history and God’s mercy. It really helps grow in faith. This is superb and powerful! Thank you and God bless! It was a beautiful presentation. Very moving! I loved the way each section started with a story of a Marian Apparition. I was so moved that I ordered the CD’s. I love watching them over and over. The Blessed Mother is so important in my life and should be in everyone’s life. I watched the bible and the Virgin Mary at 3 different offerings and each time I watch I gained new information that strengthened my belief in the Blessed Mother and her place in Holy Scripture at Mother Mediator and ‘Her’ importance in ‘Salvation History’.I feel blessed being a Catholic and how lucky we have the Blessed Virgin Mary watching over us. After taking this online course I can’t understand why our Christian brothers remain recalcitrant towards our Blessed Mother. This was a great presentation and if it came my way again I would take it again as a review. Thank you for letting me share in this program. The study was wonderful and I will keep the workbook for future reference. I especially like the fact that Dr Hahn and the Matthew Leonard are both former Protestants. Since I currently attend a Protestant church and was brought up Presbyterian, this means a lot to me. Lots of food for thought and prayer in this study. Thank you so much for making it available! God bless you all! Amazing series! Easy to follow and so informative. Explains so many nuances that I never pieced together before, and I really appreciated the recaps of prior lessons in bringing everything together. Excellent for novices who may be intimidated by a bible study group. I also loved the clips at the beginning on the apparitions. Thank you! 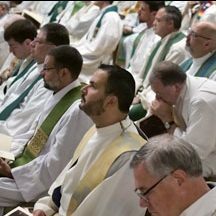 Outside of mass, I have never been instructed in the Bible nor shown how to see the connections between the prophets’ words and those in the New Testament. I needed the intelligent hand holding that was laid out in this series. The series has excellent content, was well filmed and produced, and has a calm manner that is beautiful and let’s the subject be exciting. I wasn’t able to take part in all the different showings but always love listening to Mathew Leonard as he explains things so well, and is very enthusiastic ! I have been watching The Bible and the Virgin Mary. As ‘discontinuity’ is so ‘lived out’ in the spiritual desert I live in in Belgium, this was a fresh wind. Especially the structure of the classes beginning with a Marian apparition was really an eyeopener to me. We do not have to live on ‘academical faith’ OR ‘devotions’. Nor do we have to see them as inferior. This is a testimony of the fact our faith is alive and a steppingstone to fully integrate the faith in our life. Special thanks to the auther and all who made it possible to watch this for free. On top of this it was visually very enjoyable to watch en listen to! Thank you! Both series were excellent in content plus delivery. I learned much as well refreshed what I had learned earlier. I confidence that any presentations coming from St Paul Center are orthodox as well as a joy to listen to/watch. May the Holy Spirit continue to inspire and guide you all. This was an excellent course. The information really helped to enhance my knowledge of the Blessed Virgin and her role in the life of Jesus and in our lives. I have always loved Mary and did do a lot of reading to learn more about her. But this course really brought out her message to the world by focusing on her apparitions to so many saints and the amazing things that followed. I would recommend this course to anyone with a desire to learn more about our Blessed Mother. The Bible and the Virgin Mary; I told all my bible study ladies to join in and about 13 of them did. So many learned for the first time the vital role the Blessed Mother played in our Salvation history. It was a very positive experience for us. Learning the Biblical foundation for our beliefs about Mary was awe inspiring! Knowing Mary is vital to our faith, and learning why we believe what we do just wraps it all up for us. I’m so glad to be Catholic! Thank you for putting that wonderful series together. I appreciated the connection between the different Marian shrines and the different Scriptural roles of Mary. This was an amazing series. I loved the explanations of how the OT points to Mary in the NT. I loved the pictures!!! Everything about this series was so beautiful but I didn’t have to watch it a few times to grasp all that was said. There’s a lot of information in our Bible! I’m a cradle Catholic with a deep love for our faith. Watching both the series on our Mother Mary and on the Sacraments has given me the words to convey my faith to others and where the Bible confirms these beliefs. Thank you for running these series for free. Please continue to make these available during the special seasons of the year. I bought the series on the Sacraments to review with my grandchildren and may buy the series on Mother Mary next year. I highly recommend that everyone watch a least one episode, because once you see one, no one will have to tell you to watch another you will be drawn to it! Excellent insights to our mother and the mother of our Lord. Beautifully done. I hope to run as a study at my parish soon. Thank you and God’s continued blessings. The Bible and the Virgin Mary has been one of my favorites to watch and learn so much about our holy mother. The images were amazing and it was well explained. I love the way Matthew Leonard explains each episode. It has enriched my spiritual life and increased my faith. Thank you so much for delivering educational and inspirational biblical studies to help us grow in our faith. Beautiful as Mary is beautiful. Because of this bible study, my faith was enriched and my devotion to Mary increased. I am proud to be a Catholic now. Thanks you Scott and Matthew. May God bless your work continuously. Excellent videos. Beautifully well done. It gives me a better understanding of the presence of our dear beloved Mother Mary through out the bible, from beginning to end and how to explain it to others. Hope one day it can be translated into Spanish to share it with my Spanish speaking fellows without reading sub-titles. That will be a great help to bring back to our faith many fallen away Catholics that are caught into Protestantism as soon as they come to the Unite States of America thinking that is the right thing to do here! Wish you the best. God bless you all. Very upbuilding and enriching series. I ended up recommending it to a lot of friends whom I felt would benefit from listening to these truths about Our Mother. May God bless you a hundredfold. The Bible and the Virgin Mary was the best tool I found to explain Marian devotions. I am a convert and have always had the devotion but never understood all the connections that are so fully explained in this series. I am a CCD teacher and this helps me to explain things to my students as well. Thank you for producing this series and I bought the companion books which were great support material. I’veenjoyed it twice now during free streaming opportunities. God bless all y’all for all you do! I gifted the DVD set to a protestant convert that joined our parish. He told me he still struggles with Mary’s status and role in the Catholic Church. “The Bible and the Virgin Mary” has helped him greatly on his journey. Thank you St. Paul Center for your powerful evangelization through excellent catechesis. This is excellent! Not only have a learned from this study but I now have the tools to defend Marion doctrine. 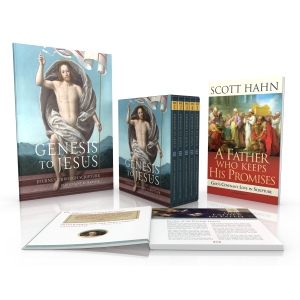 These are wonderful – it was offered again for free over Advent and each episode was incredibly helpful for me and my family. It is a great resource for parishes, Cursillo groups, schools and youth ministry. The Biblical and theological basis for our understanding of Mary is so well conveyed! While primarily focused on Catholic viewers to strengthen our faith, common objections from our nonCatholic brothers and sisters are addressed in a cogent, faith-filled, well documented and loving way as the series progresses. This is an awesome treasure. Does it come in English only? How bout Spanish? Spanish Subtitles are available on both the DVD and streaming versions of these videos. Spanish workbooks and leader guides are also available. Thanks for asking, and God bless you! Oh my God: spread the word!!! This series on The Bible and the Virgin Mary was just given at my parish of St. Bernadette, in Port St. Lucie, Florida. After Mass and a light breakfast, each week, Matthew Leonard us on a journey that deepened our understanding of Mary, our Mother, in the light of Scripture. I can not speak highly enough of the quality, content and the way in which Matthew Leonard taught us each week. “Full of grace” will never mean the same to us at St. Bernadette! The free streaming only ran through August 31. Sorry you missed it. I hope you enjoy the videos.